Once again this Saturday there were three highly competitive quads. Three masters, Ian Harris, Daniel Lowinger and Oliver Chernin as well as young expert Jason Shi squared off in the top quad. Harris and Lowinger both won their first two games, setting up another final round showdown between the two. Lowinger got Harris into trouble early on. Harris then attempted to slither away in one of his now “signature king walks”, however, just before escaping he succumbed in a final time scramble flourish. 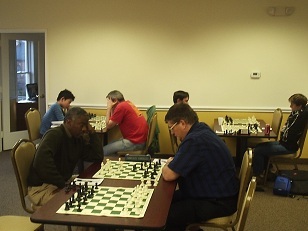 Meanwhile, in a very tight second quad, CCFC Director Melvin Patrick looked to be cruising to victory after winning his first two games, but was caught in the final round by Leo Bykhovsky who put an end to his run. The two tied for first with 2/3 each. Finally, in the third quad Calder Rossi seemed to be running away with the section, but lost a dramatic final round game to CCFC Dream Teamer Henry Stratakis-Allen! As most of the players in this section split points, it created a three way tie for first between Rossi, Henry and Grant Wang.